While Deputy Health Minister Yaakov Litzman and MK Yisrael Eichler support unification of haredi parties, Deri's supporters are reluctant. Is the union of haredi parties on the way? The “Committee of Eight”, the decision-making body of the Agudat Yisrael party, which met on Tuesday, discussed among other things the initiative to have the haredi parties – Agudat Yisrael, Degel Hatorah and Shas – to run for the Knesset on one list. According to a report on Kan News, Deputy Health Minister Yaakov Litzman pushed the initiative at the meeting. "Shas is stumbling in the polls between four seats and not passing the electoral threshold, how can we let Shas crash?" Litzman was quoted as saying. "We must do everything for haredi unity, in order to preserve this party." 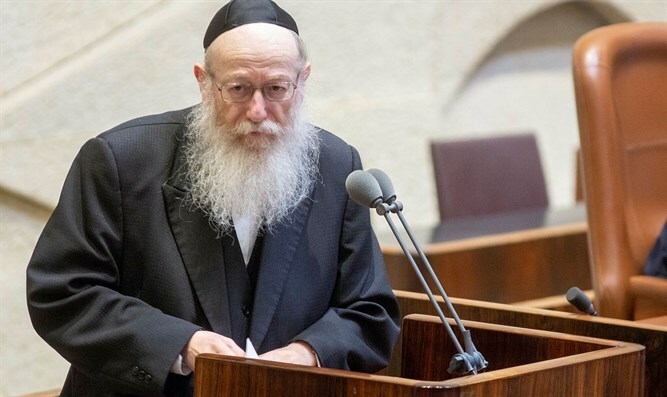 "All of haredi Judaism will lose if Shas crashes," warned Litzman, adding that all the haredi factions would be included in the unity process. "Eli Yishai and the Jerusalem faction must be a part of this as well." MK Yisrael Eichler has also expressed support for the initiative. "All the parties in the center and on the left want to undermine the foundations of religion from the state and remove the haredim from public legitimacy. This danger requires us to unite, otherwise we cannot exist here," he told Radio Kol Chai. "First and foremost, everyone should be convinced that there is no other way. We learned in the last elections that the split caused destruction. The heads of the parties, [Moshe] Gafni and Litzman, are prepared for this, and [Shas chairman Aryeh] Deri is also willing to do it, but they are afraid that some of the Shas voters will go elsewhere, so that's a problem here. We have 18 mandates from the previous Knesset, but many went elsewhere, and maybe this union will bring everyone home," added Eichler. Meanwhile, associates of Deri were quoted in a conversation with Kan News as opposing the initiative. "The municipal elections proved that Shas is very strong after 272,000 people voted for Shas, and this is not counting the Arab sector and other localities where Shas did not contend. Many dozens of Shas representatives all over the country prove that the party is only getting stronger and the same will be true in the Knesset elections," they said. Earlier this week, Deri rejected the initiative to unify the haredi parties, claiming he had received no official proposal on the issue while also pointing out the success Shas had in the municipal elections. Last week, Shas MK Michael Malchieli said there is “no point” in considering a union of the haredi parties.